45° angled connector from Koolance with the great quality you know and love from Koolance! Thanks to the low height of only 2cm, the possibilities of this angled connector are virtually unlimited. It is even possible to connect multiple of these connectors to each other for difficult connection tasks. 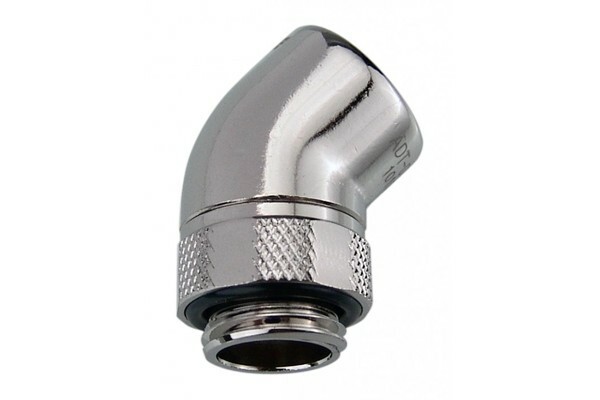 G1/4" threads ensure compatibility with all common fittings in the water cooling sector. Free revolvability is possible thanks to the joint above the outer thread. Gaskets are integrated into this joint to prevent any coolant leaks. An optimized inner design ensures that no additional flow resistance is induced! Deep black, Koolance's answer to common surface coatings! In this connector, excellent quality means functionality and exceptional quality of manufacturing! THe black os deep and thorough, looking just as if the whole fitting material was dark black. A truly unique feature, just as one would expect from Koolance!